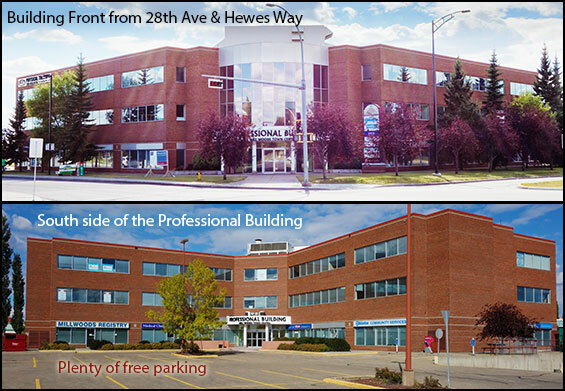 Our new location as of November 2014, is on the 2nd floor of the Mill Woods Town Centre Professional Building. It's the three-story brick building on the corner of Hewes Way and 28th Avenue, 'kitty-corner' from the main street CIBC, and just north of both the Town Centre Mall and the new Library. We are on a major bus route with a bus stop right beside us, and the MillWoods bus terminal just a half block down the street. There is plenty of free parking behind our building and you can find us on the second floor. Here are some images of our building so you'll recognize us when you get there.